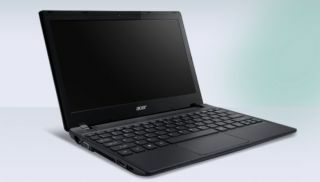 Acer has added a new model to its Travelmate family that sits somewhere between an Ultrabook and a netbook and is targeting the educational and business markets. Perhaps the most interesting feature of the new B112P is its lack of a fan, which means that Acer designed the laptop to be a good heat dissipator; aluminium is a major component of its design, which the Taiwanese company calls FlowCurve. The top-of-the-range unit features an unknown quad-core Pentium processor. Intel has five SKUs (stock keeping units, or versions of the device), all Bay Trail-based, with 4 threads, 2MB cache and Intel HD Graphics. TDP (Thermal Dissipation Power) range from 7.5W to 10W and are clocked at up to 2.66GHz. At 21.2mm thick and with a weight of 1.19Kg, it should be compact enough for most bags. Other features include up to 8GB RAM, a 128GB SSD, a 11.6-inch display with a 1,366 x 768 pixel-resolution, optional touchscreen capabilities, a full size keyboard, a HD webcam and is powered by Windows 8.1. Also bundled with the laptop are a number of applications including Office Manager, Contact Pickup, Face Login, Touch Tools, Screen Grasp and AccuFinger, all of which are developed by Acer. It will be interesting to see whether the company delivers a Chromebook version of this product. The TravelMate B115 will be available in the UK from July for £349 (about US$ 588, AU$600).